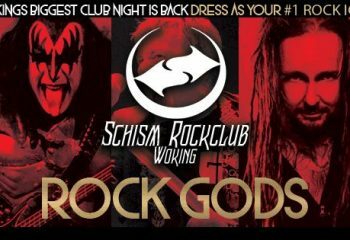 Schism Woking – Fiery Bird Launch Party & Rock Gods! SCHISM: WOKING’S BIGGEST CLUB NIGHT IS BACK !!! All good things come to those who wait, but our time spent waiting is finally over. The original Schism returns home to where it all began on a cold February night in 2002. Since launching we’ve been all about the music and so to celebrate the theme is ROCK GODS, come dressed as your musical hero. As ever, take it seriously, or take the piss with it. The only thing we ask is that on the night you have a great time. Quake may now be The Fiery Bird, but Schism remains the same perfect mix of epic music, great drinks, beautiful atmosphere and an amazing crowd of you awesome people. Those who go to Guildford Schism will be able to pick up a money off voucher for our re-launch night in Woking, so don’t miss that one. It’s like Woking Schism, but smaller venue and a pole. Guildford will continue on the last Friday of the month, with Woking taking back its usual spot of first Friday. Since we shut our Woking doors in November last year, we’ve been waiting for this moment and now it’s here. So get yourself down for what should be one hell of a party and celebration, as we bring Schism back to its home.